Personalized Cotton Canvas Tote Bags Wholesale Custom Printed Bulk. Unit prices below include your 1-color imprint on one side. Add the amount shown for each additional imprint color.We also sell blank tote bags for $1.40 each (minimum quantity: 100). Additional Imprint location: please add $0.42 per cotton tote bag. $40.00 per color; $25.00 on re-orders. 5 days after art approval. 15'' x 16" shopping cotton canvas tote bags in bulk, Natural color, 100% middleweight 7 oz. cotton, with either 22" long (shoulder length) handles or short, 12 in. handles: please specify when ordering. Natural Biodegradable Material. Unit prices below include your 1-color imprint. Add the amount shown for each extra imprint color. We also sell blank (not personalized) cotton tote bags for $2.32 each (minimum quantity: 100). 15" x 16" cotton canvas tote bags in bulk. 100% middle weight, 7 oz. cotton, with 22" long (shoulder length). Eco-Friendly: Naturally Biodegradable Material. Colors: Black, Green, Navy Blue, Orange, Pink, Red, Royal Blue, White, Yellow. Other colors are available: see photo. Unit prices below include your 1-color imprint on one side. We also sell blank (not personalized) cottton canvas bags for $2.98 each (minimum quantity: 100). 15" x 16"x 4" (gusseted) cotton canvas tote bags in bulk, Natural color, 100% heavyweight 12 oz. cotton, with 24" long (shoulder length) colored handles: Royal Blue, Black, Hunter Green, Red, Navy Blue, Burgundy (your choice). Maximum imprint area: 10"x10". Naturally Biodegradable Material. Production Time: 5 days after art approval. Rush 2-day Production is available: contact us. Personalized Canvas Tote Bags Wholesale -Inexpensive Canvas Tote Bags Custom Printed in Bulk. Promotional, Lowest prices in the USA and Canada. Free Art Design and Fast Delivery. 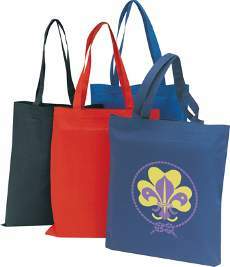 Cotton canvas tote bags in bulk with large imprint areas on one or both sides. 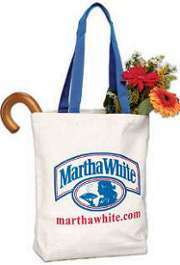 We have the Budget Prices in the USA and Canada for personalized cotton canvas tote bags in bulk. Our wholesale custom imprinted canvas tote bags are available in 6 styles with different sizes or canvas thickness (see photos and descriptions below). The canvas bags are currently on sale at 60-65% of the regular prices (see the discounted prices in the Price Table below). Our bulk canvas tote bags may be also embroidered: contact us.